When Daniel was summoned to interpret the dream of Nebuchadnezzar he gave God the credit for his wisdom seeing the magicians or astrologers could not show the king the answer needed for his dream, but it was by the Spirit of God was knowledge given to Daniel. (Daniel 2:10-11,19-23). The Chaldeans answered before the king, and said, There is not a man upon the earth that can shew the king’s matter: therefore there is no king, lord, nor ruler, that asked such things at any magician, or astrologer, or Chaldean. And it is a rare thing that the king requireth, and there is none other that can shew it before the king, except the gods, whose dwelling is not with flesh. Then was the secret revealed unto Daniel in a night vision. Then Daniel blessed the God of heaven. Daniel answered and said, Blessed be the name of God for ever and ever: for wisdom and might are his: And he changeth the times and the seasons: he removeth kings, and setteth up kings: he giveth wisdom unto the wise, and knowledge to them that know understanding: He revealeth the deep and secret things: he knoweth what is in the darkness, and the light dwelleth with him. I thank thee, and praise thee, O thou God of my fathers, who hast given me wisdom and might, and hast made known unto me now what we desired of thee: for thou hast now made known unto us the king’s matter. It is written the wisdom of the world is foolishness to God, for when God calls His people they are not what the world would consider the highly influential among men. (1 Corinthians 1:20,25-31). Where is the wise? where is the scribe? where is the disputer of this world? hath not God made foolish the wisdom of this world? Because the foolishness of God is wiser than men; and the weakness of God is stronger than men. For ye see your calling, brethren, how that not many wise men after the flesh, not many mighty, not many noble, are called: But God hath chosen the foolish things of the world to confound the wise; and God hath chosen the weak things of the world to confound the things which are mighty; And base things of the world, and things which are despised, hath God chosen, yea, and things which are not, to bring to nought things that are: That no flesh should glory in his presence. But of him are ye in Christ Jesus, who of God is made unto us wisdom, and righteousness, and sanctification, and redemption: That, according as it is written, He that glorieth, let him glory in the Lord. Only the foolish would go through life believing that God cannot see their actions, as though He can create the entire earth and everything upon it yet not see or know the way of man. (Psalm 94:7-15). There is so much worth learning of the Lord we serve, and a lot of it is our saving grace! (Psalm 19:7-11). 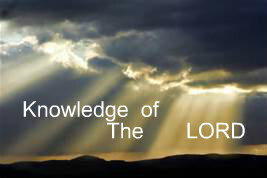 The law of the Lord is perfect, converting the soul: the testimony of the Lord is sure, making wise the simple. The statutes of the Lord are right, rejoicing the heart: the commandment of the Lord is pure, enlightening the eyes. The fear of the Lord is clean, enduring for ever: the judgments of the Lord are true and righteous altogether. More to be desired are they than gold, yea, than much fine gold: sweeter also than honey and the honeycomb. Moreover by them is thy servant warned: and in keeping of them there is great reward.